Before The Night Is Through has the potential to be a fine piece of British musical theatre. Part Downton Abbey on acid, part Punchdrunk's The Drowned Man, Olivia Thompson has fashioned a murder mystery set in the mansion of a 1930s film star, Honey Quenelle. 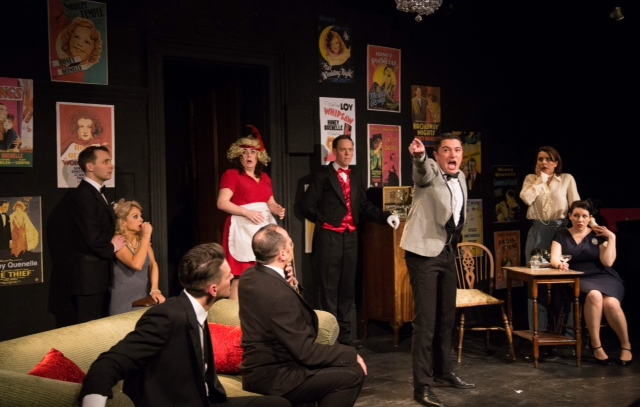 The first half in particular shows immense promise, motives and macguffins abound with the strength of this production lying in the stellar talent of its cast. All ten performers flap with utter aplomb, whilst special tribute to Thompson herself who stepped in to fill the breach at the last minute after a cast member became indisposed. The show is more caricature than character, with Katie Brennan's Mabel, a maid-servant clearly inspired by Baldrick and Ian Mowat's penniless aristocrat Stubby, particularly well crafted comic creations. Amelia Adams Pearce is every inch the refined Honey, defining the elegance of the era, whilst Kieran Brown's dashing detective has a cracking number A Very Touching Story, that shows the actor at his best. Jenny Gayner's flapper Farmonica is an outrageously manic creation of perfect balance and sublime comic timing, who at times suggested a 21st century Bette Davis. Gayner’s performance was only enhanced by an unplanned jewellery malfunction giving rise to a stunning pearl necklace spillage, truly something not often seen on London's fringe. Rob McWhir again extracts the best from a talented bunch and most of Cressida Carre's choreography works too, though the torchlit dances lost their gimmick second time around. The creative star of the show however is Chris Whitehead (who also musically directs on piano) whose well created compositions were an accurate take on the era. There was a hint of ragtime and charleston to some of his melodies as well as a fabulous waltz whilst the vocal harmonies that ranged from two to eight part are exquisite. As it stands though, the show is very much a work in progress and Thompson needs to take a scalpel to her second act. It's a complicated plot that unfolds, at times too complicated and a twenty minute trim wouldn't go amiss. But bravo to Katy Lipson for mounting the From Page To Stage season. This is precisely the sort of well crafted work that is to be encouraged and a revised, honed version of Before The Night Is Through could yet have a commercial future. Jeff Harnar - Does This Song Make Me Look Fat?